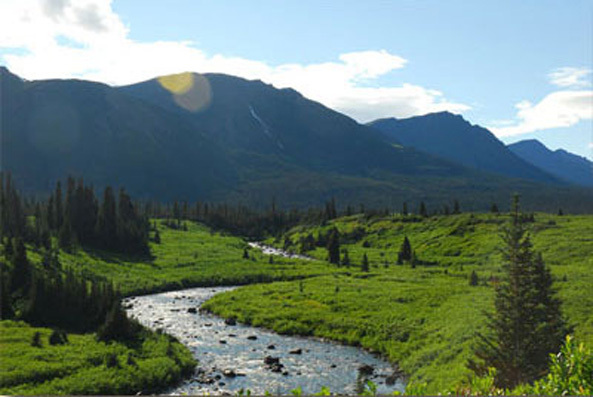 The Sacred Headwaters region is made of rivers and plateaus surrounded by the Coast Mountains to the west and the Rocky Mountains to the east. The Stikine is the largest of the area’s three rivers; at 400 miles long, it travels through deep canyons to its estuary near Wrangell, Alaska. The people of Klabona share aspects of aboriginal coastal and plateau cultures, due to their dependence on both fish from the coast and intricate system of inland rivers, and game that roam through the drier lands of the province’s interior. The Tahltan live in the upper Stikine River region, a dry plateau in the Coast Mountains overlooking clear-water rivers, lakes and streams. They have a long tradition of association with the Tlingit, who would trade goods from the Alaskan coast. Like the Tlingit, the Tahltan (made up of the Tahltan and Iskut Bands) are a matrilineal people with totemic clans. Their neighbors to the south are the Wet’suwet’en and the Gitxsan. The people of Klabona were more nomadic than those who lived on the coast: they traditionally followed a seasonal pattern: fishing in the spring, moving east to dry the fish in late summer and begin hunting small game in the lower-altitude mountains, then higher up to large game (moose, caribou, sheep and goat) in the fall, and with winter provisions, heading indoors to tell stories, sing, and dance. Gold was discovered along the Stikine River in 1862, which led to the creation of the Stikine Territory within the province of British Columbia and the influx of mining and other extractive industries into the Sacred Headwaters. The Tahltan, Wet’suwet’en, and the Gitxsan never signed any treaty with the Canadian or B.C. government, so their land has never been legally ceded. However, both governments have permitted corporate exploration and resource extraction to proceed on those lands for generations. The Wet’suwet’en and Gitxsan made legal history in Canada when 48 of their hereditary chiefs came together to claim in court that they had never relinquished title to their traditional lands, that they had a right to self-government, and that they should receive compensation for previous loss of land and resources. The Delgamuukw case went to the Canadian Supreme Court in 1997, which ruled that First Nations have Aboriginal title over land that has an integral link to their culture. However, governments may overrule Aboriginal title if they have a “compelling and substantial legislative objective,” in which case they must provide First Nations with “fair compensation”—an ultimately ambiguous ruling with details still being tested. Today, Klabona is a hotbed of industrial activity: at least a dozen companies currently have leases or permission to explore in the area, with eight major mining projects actively in exploration or development. The untapped revenue potential of gold, coal, methane gas, timber, and hydroelectric power is a major incentive for the British Columbia provincial government to fast-track permits for these companies, as well as amend existing laws. First Nations peoples have responded to the situation with protests, road and waterway blockages, and lawsuits. Major resource extraction projects in Klabona include Shell Canada, Imperial Metals, Fortune Minerals and Nova Gold. Shell Canada, based in Calgary, Alberta, began to drill test wells for coal bed methane exploration around Mount Klappan in 2004. Its bulldozers tore through traditional Tahltan hunting camps and traplines to make a new road for drilling equipment. Coal bed methane is natural gas, held within coal by water pressure. Releasing the methane requires pumping out the salty and polluted water that is discharged and, in the Klabona area, seeps into salmon streams. Shell Canada hoped the test wells would confirm the presence of a potential 8.3 trillion cubic feet of coal bed methane. When the community pressed Shell for details on the number of planned wells, a Shell representative admitted that they were looking to construct one to four wells per square mile. This would amount to between 1,500 and 6,000 wells, along with supporting infrastructure including roads, compressors, power lines, and pipelines. In August 2006, the Tahltan Central Council (TCC) voted against allowing Shell Canada to drill test wells, fearing extreme water pollution, and protesters have been blocking an access road since 2005. The united opposition of the Tahltan and Iskut communities has temporarily halted Shell’s plans for drilling in the Klappan region, but Shell continues to seek an injunction to remove the protesters. With the assumption of control by Royal Dutch Shell in June 2007, there are signs that the company will step up its effort to resume drilling. Another dramatic road blockade in June 2006 by Iskut and Tahltan grandmothers failed to prevent bcMetals (now Imperial Metals) from test drilling for copper and gold test drilling in the Todagin Wildlife Management Area. The grandmothers claimed that BC Metals had allowed oil to leak into Coyote Creek, a critical waterway for trout-spawning that flows through the wildlife area. Prior to the blockade, the company had already begun copper and gold test drilling within the wildlife area, and was rushing to set up its operations before the July spawning and rearing season, after which B.C.’s Water Act forbids working around trout waters. The blockade attracted additional support from the Gitxan and Wet’suwet’en First Nations and lasted two months before the B.C. Supreme Court granted an injunction against the activists in September. The injunction required them to let the company pass, threatening that they would be denied access to their traditional hunting grounds if they did not comply with the court’s order. Lillian Moyer was arrested by the Royal Canadian Mounted Police on behalf of the 100-plus protesters, saying: “I am being arrested today for the people of Iskut, for the people of Telegraph Creek, and especially for our grandchildren. I believe my ancestors are speaking through me.” Drilling has since resumed. The open-pit mine, scheduled for completion in late 2008, is anticipated to have a 25 year project life, but new tests indicate the reserves may be double what was originally estimated, which would lead to an expansion of the project area. BC Metals has attempted to win the support of the Tahltan community by offering small contracts for logging in the project area and the construction of the access road to Tahltan companies. However, pointing to the Coyote Creek oil spill in 2006, activists predict that the open pit mine will bring many more environmental disasters, including the plan to dump mine tailings into a fish-bearing creek. Fortune Minerals plans to develop an open-pit coal mine in the Lost Fox coal fields on Mount Klappan. The coal would supply a power plant, which would support other mining projects in the area. From July to September 2005, several dozen elders from the Tahltan and Iskut bands and their supporters blocked road access to the fields, thereby preventing Fortune Minerals from conducting exploration activities. The corporation sued and won an injunction against the Tahltan activists. Through an organized media campaign and outreach to activist organizations around Canada, the Tahltan raised awareness of their activities, attracting 200 First Nations people from around Canada, who traveled to the nearby town of Terrace to show support for the protestors. They issued a declaration that future development of the Sacred Headwaters area will only proceed with “First Nations’ free, prior and informed consent.” Two months later, the B.C. Supreme Court rejected Fortune Minerals’s request to renew its injunction against the Tahltan for blocking access. The judge also required the company to pay for the legal costs of the 15 Tahltan and Iskut who were arrested at the blockade. However, Fortune has moved forward with its plans. It announced in February 2007 that it had completed a feasibility study of the Lost Fox mine and determined that the mine could produce a 25-year fuel supply for a 300 megawatt power plant. The company must still get permission from the provincial government to open and operate the mine and power plant, as well as to extend the BC railway past Mount Klappan to connect with the Alaska Railway. Nova Gold’s proposed Galore copper-gold-silver mine is in the lower Stikine area, so some Tahltan feel that its location away from the Headwaters means it will avoid damaging the critical sacred landscape. 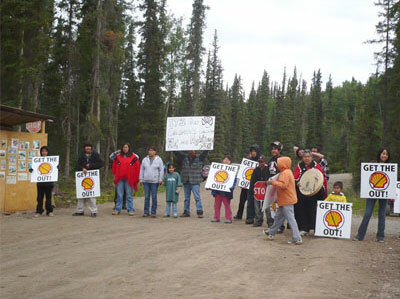 However, the community remains divided, with some elders and youth protesting that they were rushed into a decision. Nevertheless the Tahltan Central Council has written an endorsement letter praising the company’s “social and environmental responsibility.” In February 2007, Nova Gold received its final environmental permits from the provincial government and construction is currently underway. Mining is expected to begin in 2012, with an estimated life of mine of at least 20 years. These and other environmental threats to the Sacred Headwaters area have caused First Nations leaders from around Canada to gather at Klabona and speak out in a united voice. Canadian law holds that Crown Title (settler claims to the land) is subordinate to the Aboriginal Title of the indigenous inhabitants, but until Aboriginal Title claims are recognized, the B.C. government maintains it has the right to issue permits and leases for development. Gordon Campbell, Premier of British Columbia, has made much of his government’s support for consulting Aboriginal communities about projects that impact their land; however, so far it appears that companies consult purely for public relations and then proceed as they wish. First Nations leaders from around Canada gathered at Klabona in August 2006 to discuss the development frenzy. They noted that British Columbia has proclaimed that the 2010 Winter Olympics in Vancouver will be history’s “greenest” but that this claim appears disingenuous when compared with the reality of quasi-unregulated mining, drilling, and logging throughout sacred indigenous lands. Support the No Dirty Gold campaign—tell jewelers and activists that the Kemess, Galore, and Red Chris mines need to be added to the “No Dirty Gold” list of companies destroying indigenous cultures, lands, title and rights. Hume, Mark. “Band finds it’s not alone in fight for wilderness.” The Globe and Mail, August 8, 2006. Office of the Wet’suwet’en. Office of the Wet’suwet’en. School District 87 Stikine. “Tahltan Nation.” Dease Lake Community Website. Skeena Watershed Conservation Coalition. Skeena Watershed Conservation Coalition. Smith, Merran. “Royal Dutch Shell Inherits Explosive BC Conflict.” The Tyee, June 12, 2007.